Photo Credit: Bill Eppridge. The Life Picture Collection, copyright © Time, Inc. The assassination of Robert Kennedy on June 5, 1968, has never attracted the same level of public fascination and passion as the 1963 assassination of his brother, President John F. Kennedy. But, the passing of Bobby, as many affectionately called him, may have impacted our country in a more significant manner. Robert Kennedy was unique in American politics; he reached out to the poor and disenfranchised, he reached out to working class whites, he reached out to inner city blacks, he reached out to the migrant worker - the very classes of people most politicians of that time ignored. He came from a place of privilege and money, yet passionately spoke for the victimized and the oppressed. Robert Kennedy embodied an attitude and idealism that is rare for any generation. By leading with an inspiring call to action he asked the American people of that time to support racial and educational equality, to accept environmental responsibility and to negotiate for peace in a war ravaged world. 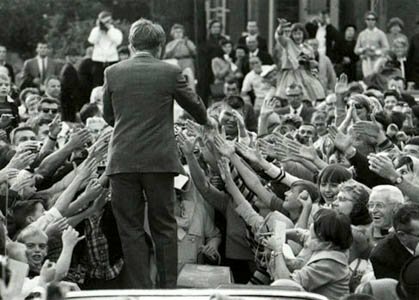 RFK asked Americans to believe that as individuals they could make a difference in the world. June 5, 2008 marks the 40th anniversary of Sen. Kennedy's assassination. LOS ANGELES (AFP) - Forty years ago, on June 5, 1968, Robert F. Kennedy was brimming with the confidence of a young, charismatic and liberal political star. He had just won the California Democratic primary, giving him a strong chance to win the party's presidential nomination, rising out of the shadow of his brother John F. Kennedy, the president murdered less than five years before. And in a split second, its was all over: a deranged Palestinian shot him dead in a Los Angeles hotel as he reveled in his victory. The assassination of Bobby Kennedy plunged the United States into deep trauma. It came in the wake of the devastating Tet offensive against US and South Vietnamese troops in Vietnam, which showed the US was not winning the war and forced then-president Lyndon Johnson, also a Democrat, to concede that he was too weak to seek the White House in that November's election. And it followed by two months the April 4 assassination of civil rights leader Martin Luther King in Memphis, Tennessee, which sparked riots across the country. Johnson's decision to bow out from the race opened the door to Kennedy to jump in the battle against liberal anti-war hero, senator Eugene McCarthy, and Johnson's more conservative vice president Hubert Humphrey that March. But Kennedy, who also took a stance against the increasingly unpopular war, had the advantage of youth -- he was just 42, his powerful name, his experience as attorney general under his brother, and then nearly four years as senator from New York. The primary in California, the country's most populous state, was key, and Kennedy came out of it with a big advance, putting him ahead of McCarthy and with the possibility of catching up with Humphrey. But what for many was the second Kennedy "dream" was again cut short. As he entered the kitchen of the Ambassador Hotel to thank supporters, Sirhan Sirhan pulled out a pistol and at close range shot Bobby several times, including once in the head. Kennedy died the next day, leaving behind wife Ethel, 10 children and an 11th soon to be born, and a clan and the nation in shock at yet another Kennedy tragedy. 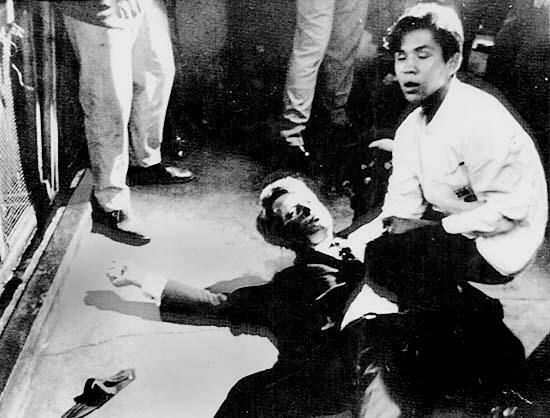 The photograph of a young assistant chef, holding up the candidate's bloodied head as he lay on the floor, was seen around the world. Boris Yaro, then working for the Los Angeles Times, recalled in 1998 that he went not on assignment but as a fan to take pictures. "To me, Bobby represented what was left of the Camelot era of American politics, and I wanted him to win. "I wanted a picture of him for my wall -- something that said a new era was aborning." But as his victory became apparent, suddenly "there were a couple of explosions that seemed to light up the entire room," Yaro recalled. "The crowd around Bobby parted and there was a man with a contorted face and a revolver, and shots were still being fired." "I froze. 'No,' I said to myself. 'Not again. Not another Kennedy.'" In the struggle to subdue Sirhan, Yaro himself grabbed at the gun before someone else took it away. He took his pictures and went back to the newspaper. "After all the questions were over in the newsroom, I walked back to my cubbyhole darkroom in the photo department and, out of sight of everybody, I cried hot tears of anger. "I cried for me and you and all the world. Bobby would cling to life for another day, but the truth was already there: Camelot was lost." Forty years later, the desire for another "Camelot" has filled supporters of Illinois Senator Barack Obama, likened to the Kennedy brothers by some from the Massachusetts clan themselves. In January both John F. Kennedy's brother Senator Edward Kennedy and the slain president's daughter Caroline suggested Obama was his spiritual heir. But also, in what came to be seen as an ugly comparison, Obama's now-vanquished rival Hillary Clinton in May made reference to their close-quarters battle and the fact that the 1968 race changed radically when Bobby Kennedy was assassinated. The reference provoked outrage that Clinton was suggesting something nefarious, and she quickly apologized. Sirhan, a Christian-born Palestinian who first said he killed Kennedy over his support for Israel, but whose sanity was later questioned, was given a life sentence in a California prison, where he remains today. 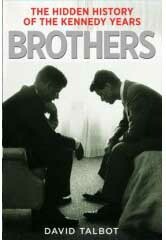 "Brothers" begins on the shattering afternoon of November 22, 1963, as a grief-stricken Robert Kennedy urgently demands answers about the assassination of his brother. Bobby's suspicions immediately focus on the nest of CIA spies, gangsters, and Cuban exiles that had long been plotting a violent regime change in Cuba. 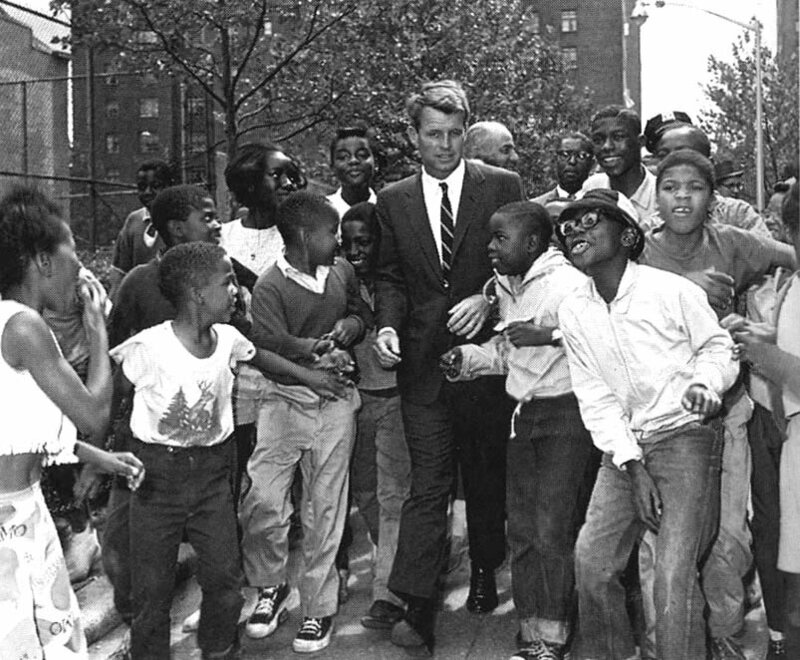 Attorney General Robert Kennedy walks down a street in New York, surrounded by children. He is visiting a summer reading program in Harlem. In the 1960s racial segregation prevented black Americans from educational opportunities, economic opportunities, from voting. Sadly, black Americans who fought against racial inequality were often victims of violence. As Attorney General, Robert Kennedy actively enforced civil right laws. His stance on civil rights became evident on May 6, 1961, when he traveled to the University of Georgia to deliver one of his first major talks as Attorney General. In that speech, RFK compared the domestic struggle for civil rights to the Free World's fight against communism. 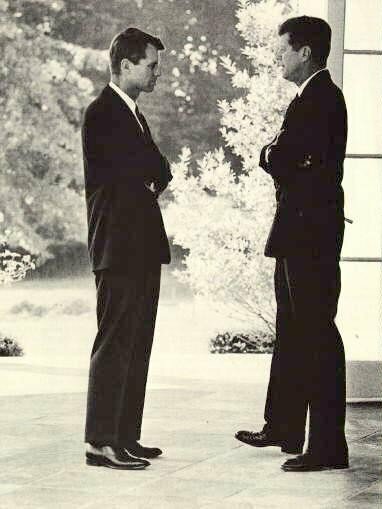 Attorney General Robert Kennedy and his brother President John Kennedy, photographed at the White House during the Cuban Missile Crisis. The Missile CrisisRobert Kennedy had a major role in the Missile Crisis. He acted as a meeting facilitator and as an unquestioned confidante to President Kennedy. Because the President could not be present at all the EX-COMM meetings, he assigned Robert Kennedy the task of facilitating the discussions. As such, Bobby Kennedy proved an excellent leader by guiding the discussions and asking complex questions. Robert Kennedy quickly exhibited his ability to analyze the situation and recognize how decisions would impact the future of the world. Robert Kennedy's second major contribution was his secret contact with Soviet Ambassador Anatoly Dobrynin. Privately, RFK was able to convey President Kennedy's position and generate a secret deal. In Khrushchev's memoirs there is a section devoted to the crisis and Robert Kennedy's communications with Ambassador Dobrynin. Read Dobrynin's cable to Khrushchev dated October 27, 1962.
www.bobby-kennedy.com is a part of JFK Lancer Publications & Productions.